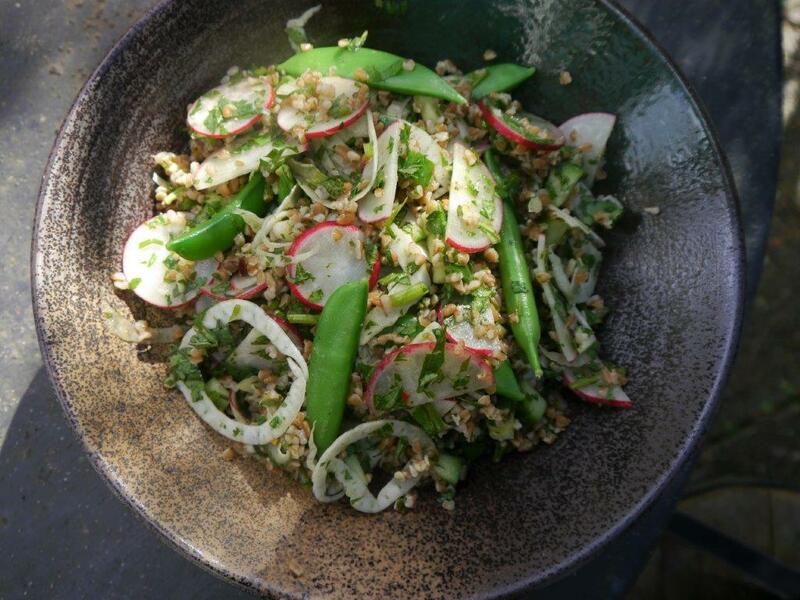 This winter I’ve made lots of different salads and this is of my favourites at the moment. Last Sunday Jason had a large pile of bunches of mint and coriander selling for only $2.50 bunch. Although I grow mint, these bunches looked so fresh I had to buy some which was, of course, too much! So, I ended up making a salad taking the idea of tabbouleh but instead of parsley I used all the mint and coriander and added a few other vegetables with a slightly spicy dressing. When you taste the dressing it’ll seem a bit astringent and strong but it needs to be as the bulgar wheat absorbs lots of flavour. It other times I use the bulgar wheat as a base to which I add a mix of vegetables. There’s no need to be precise with quantities for this recipe but make sure the quantity of chopped herbs is roughly similar to the cooked quantity of bulgar wheat. Whisk together the dressing ingredients. Once the bulgar wheat is cooked add some of the dressing while it’s still warm. Next mix in the herbs and the vegetables. Mix in more dressing and serve. This works well with grilled meats, chicken and salmon.